When I first came across this stirring tale of improvised surgery at sea I wasn’t at all sure it was true. It appeared in 1852 in a minor journal called The Scalpel, which was published in New York between 1849 and 1864. The journal was edited, and largely written, by the indefatigable Dr Edward H. Dixon, a highly-regarded expert on sexually transmitted disease and an outspoken opponent of masturbation – a vice which was a major preoccupation of American doctors of the time. Edward T. Hinckley, of Wareham, Mass., then mate of the bark Andrews, commanded by James L. Nye, of Sandwich, Mass., sailed some two years and a half since (we find the date omitted in our minutes) from New Bedford, Mass., on a whaling voyage. New Bedford was probably the busiest whaling port in the world at the time – and is now home to the most extensive museum collection of whaling-related artefacts. 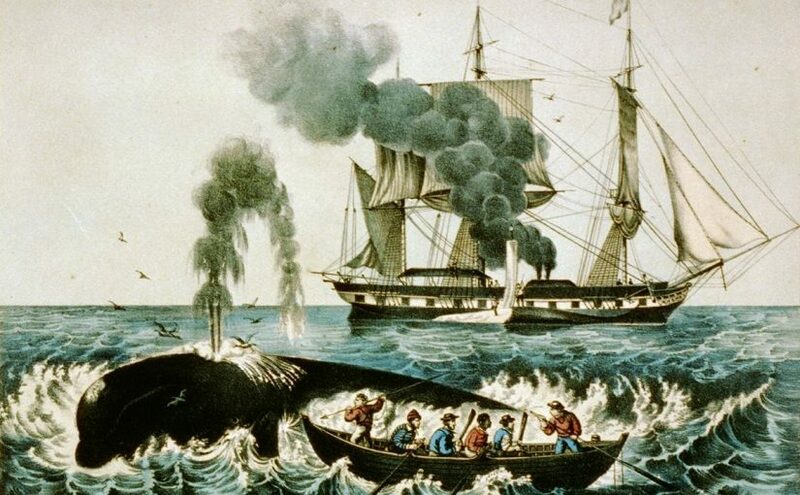 In 1850 no fewer than 87 ships set off from New Bedford on whaling expeditions. The Andrews weighed anchor on June 3rd, the start of an voyage that would last three years. Shipping records for the port of New Bedford in 1850, showing that the Ann Alexander and Andrews set off two days apart. Very few ships are known to have been sunk by whales, but on its voyage the Andrews would also have an unfortunate encounter with one. When off the Galapagos Islands, one of the hands, who had shown a mutinous disposition, attacked Captain Nye with some violence, in consequence of a reproof given him for disobedience. In the scuffle which ensued, a wound was inflicted with a knife, commencing at the angle of the jaw, and dividing the skin and superficial tissues of the left side of the neck, down to the middle of the clavicle, under which the point of the knife went. An ugly-sounding wound. The knife opened up a gash down the side of the neck, from the hinge of the jaw to the collarbone. It was done in broad day, in presence of the greater part of the crew; and Mr. Hinckley, the mate, being so near, that he was at that moment rushing to the captain’s assistance. Instantly seizing the villain, and handing him over to the crew, the knife either fell or was drawn by someone present, and a frightful gush of dark blood welled up from the wound, as the captain fell upon the deck. The ‘dark blood’ was a sign that a vein, rather than an artery, had been injured – still serious, but less immediately life-threatening. Mr. Hinckley immediately thrust his fingers into the wound, and endeavoured to catch the bleeding vessel; with the thumb against the clavicle, as a point of action, and gripping, as he expressed it to me, “all between,” he found the bleeding nearly cease. The whole affair was so sudden, that Mr. Hinckley stated to me, he was completely at a loss what step to take. An alarming position to be in. Such had been the violence of the haemorrhage, a space on the deck fully as large as a barrel head, being covered with blood in a few seconds, that it was evident from that and the consequent faintness, that the captain would instantly die, should he remove his fingers from the bleeding vessel. This was self-evidently a major blood vessel. A remarkably clear description which makes it possible to identify the blood vessels with reasonable confidence. The subclavian vein and its associated artery lie just underneath the clavicle, the vein in front of the artery. The subclavian artery is one of the major branches of the aorta – if it had been wounded instead it’s likely the captain would already have been dead. What would you do in such desperate circumstances? Mr Hinckley barely hesitated. Mr Hinckley was evidently a dab hand with a needle and thread, because this sounds ferociously difficult. Remember, he was standing on the deck of a ship having only just averted a mutiny – hardly the easiest circumstances for fine suture-work. On inquiry of Mr. Hinckley, if he cut off the thread each time and threaded the needle again, he said Yes; but “I only cut off one end, and left the other hanging out.” This he had learned from a little book, prepared for the use of sea captains and others, when no surgeon was on board. It sounds as if Mr Hinckley was a quick learner. He used an ‘interrupted’ suture technique – each stitch was separate from its neighbour. It was standard practice at the time to leave the threads dangling out through the wound – this allowed the surgeon to remove or tighten them, as necessary. Poor Captain Nye finally met a sad fate; he was drowned on the destruction of his boat by an enraged whale. It’s difficult to work out precisely what happened. 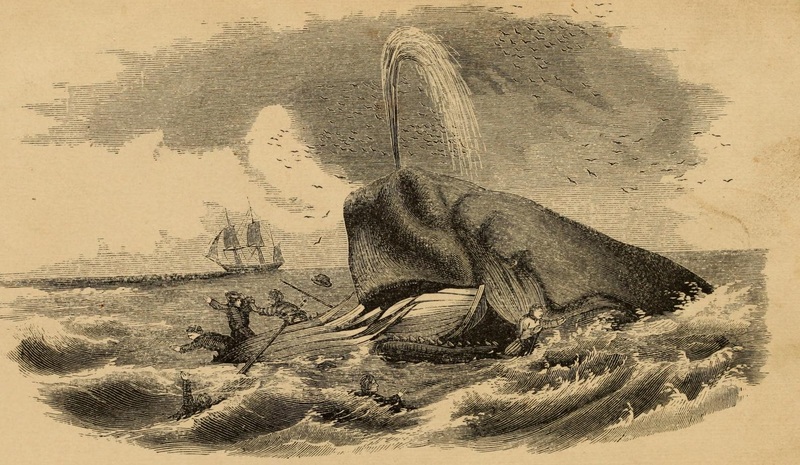 Captain Nye and two of his men were indeed killed by a whale on December 29th 1852, but the ship is recorded as having returned to port on May 3rd 1853, minus a captain but carrying 909 barrels of sperm-oil. The Andrews then apparently went back to sea, and was ‘lost on the Galapagos’ some time later that year. Of Mr Hinckley’s subsequent fate nothing is known, although I suspect he left the ship in May 1853, since his account of the operation in The Scalpel appeared some months later. We may be mistaken in our views of its importance, but we think that in the estimation of our professional readers we have placed upon record one of the most extraordinary circumstances in the whole history of Surgery. Dr Dixon has a point. Suturing veins and arteries was a notoriously difficult thing to do, and it was not until the beginning of the twentieth century that a surgeon succeeded in joining the two ends of a completely severed vessel. A specialist at any of the great hospitals of London, New York or Paris would have been proud of the result achieved by this untutored seaman on a whaling ship in the Pacific.